*Disclosure: I received product to sample from ­­­­­Dixie Crystals. All thoughts and opinions are my own. Dixie Crystals is always a generous sponsor, so with lots of sugar on hand, I couldn’t not bake something! 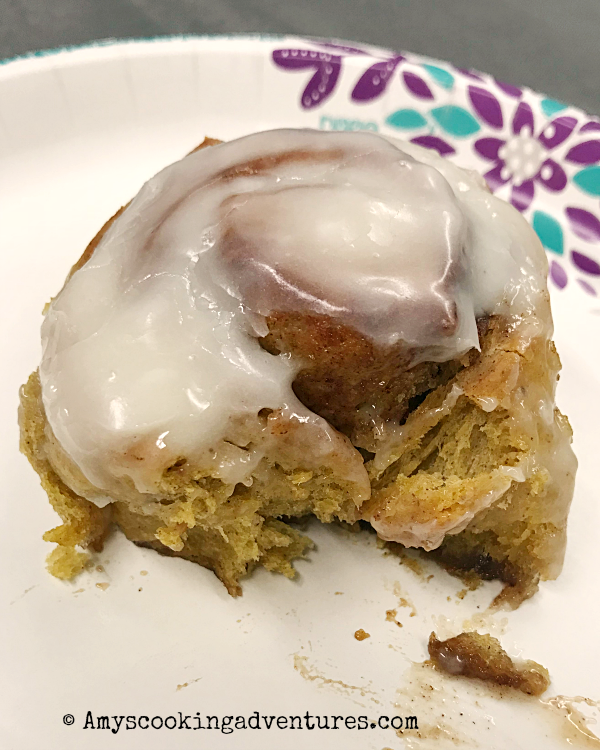 So, when my boss asked for volunteers to bring breakfast to our beginning of the year meetings, I jumped on the opportunity! 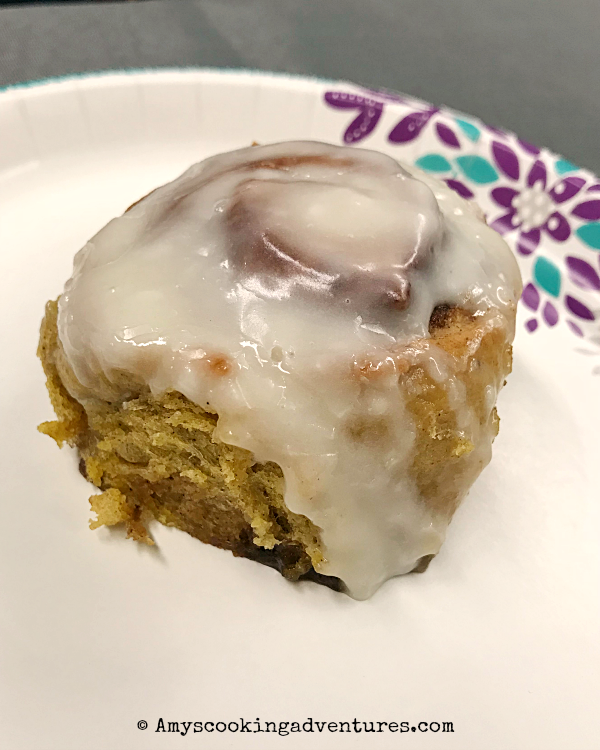 This also, sadly, means that I have some rushed on-the-way-out-the-door and cell phone pictures of the finished product, but suffice to say that the still-warm pumpkin cinnamon rolls were enough for some co-workers to declare me a hero for bringing them! These rolls have two baking options, depending on your level of morning perkiness. You may want to get up early and make these rolls with a smile on your face for your adoring family. The second option is for my follow night owls – prep these at night, bribe someone to take these out of the refrigerator an hour before baking in the morning or zombie shuffle to the refrigerator yourself and reset your alarm for another hour before baking. Either works and your adoring family (or very happy co-workers) will thank you for it! Place the water and yeast into the bowl of a stand mixer along with a pinch of sugar. Stir and set aside while the yeast activates and becomes foamy. Add the butter, buttermilk, pumpkin, egg, sugar, spices, salt, and 1 cup of flour. Mix with the paddle attachment until smooth. Switch to the dough hook and continue to add flour until the dough no longer sticks to the sides of the bowl and is not sticky (tacky is ok). Place the dough in a greased bowl and allow it to rest in a warm place for 20 minutes. Roll the dough into a large rectangle spread the butter all over the surface of the dough, keeping about ½-inch away from the edges. Sprinkle evenly with brown sugar and cinnamon, then, starting from the long end, roll into a tight cylinder. Grease a 9x13 baking dish and preheat the oven to 375 degrees F if baking right away. Cut the cylinder into 16 equal slices and arrange the rolls evenly in the prepared baking dish. Loosely cover the rolls with a kitchen towel and place in a warm area to rise for 1 hour or until the rolls are doubled in size. Bake for 15-20 or until lightly browned. During the last few minutes of cooking, make the frosting by beating together the cream cheese and powdered sugar until smooth. Stir in milk to until desired consistency is achieved. 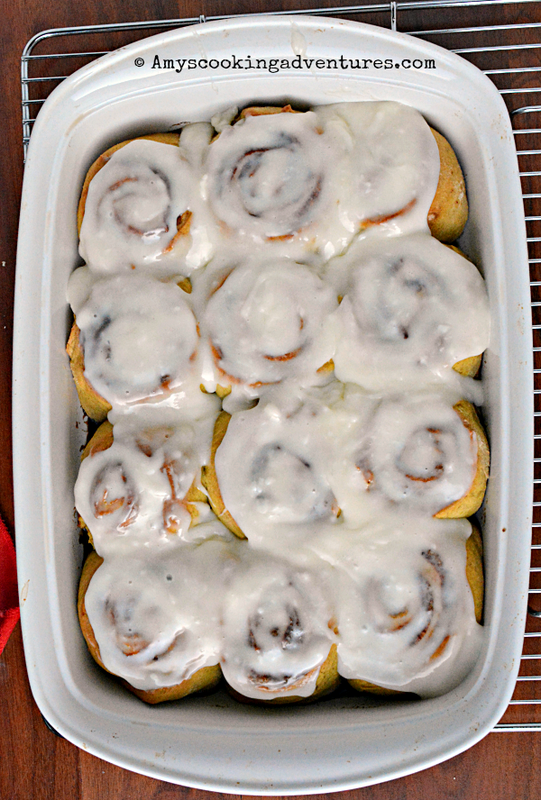 Remove the rolls from the oven and immediately slather with frosting and serve. Cover the baking dish with plastic wrap and place in the refrigerator overnight. An hour and a half before baking, remove the baking dish from the refrigerator and place in a warm area to rise for 1 ½ hours or until the rolls are doubled in size. Preheat the oven to 375 degrees F. Bake for 15-20 minutes or until lightly browned. Oh my YUM...I'm very hungry now.